It’s true! Sweet Scarlet is going on our first official (mini) tour! We’re packing up the mini vans with our 6 members, two new babies and two supportive hubbies and hitting the road for Vancouver Island! Our first stop will be the seaside town of Fanny Bay on the east coast of Vancouver Island. Our friends at the Fanny Bay Community Association have invited us to come and perform a full-length concert as part of their 2017-2018 concert series and we couldn’t be more excited! 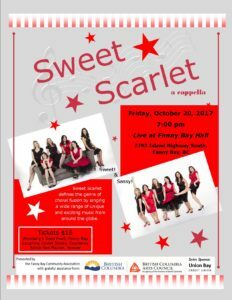 Catch us on Friday, October 20th at 7pm, live at Fanny Bay Hall (7793 Island Highway South). Tickets are only $18 and are available at Weinberg’s Good Food, Fanny Bay Laughing Oyster Books, and Courtenay Salish Sea Market. For more information about this performance, visit the Fanny Bay Community Association website. Our next stop will be the beautiful northern gulf island of Quadra Island! 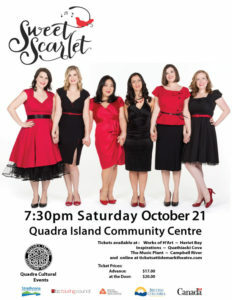 Presented by our friends at the Quadra Cultural Committee, this performance will also feature our full-length set at the Quadra Island Community Centre on Saturday, October 21st at 7:30pm. Tickets for this performance are only $17 in advance ($20 at the door) and are currently available at Works of H’Art (Heriot Bay), Inspirations (Quathiaski Cove) or through the Tidemark Theatre ticketing website. We can’t wait to get away to beautiful Vancouver Island and perform for our fans over there! Hope to see you at one of the shows! Laura’s friend Marla here. Maybe we need to see you ladies get to Calgary. I have a five bedroom home, 3 baths – free accommodation. Free. Just some food. Babies welcome. Lovely city. Maybe i can help you connected somewhere.